The results are expected to be declared on Monday, July 18 the, 2016 nearly in the afternoon around 2 pm. The Chartered Accountants Final examinations were conducted in the month of May 2016 and CPT have been carried out in the month of June 2016. Lakhs of candidates approached the CPT, which was held in the month of June. The conduct of CPT reached around 170 cities which include three abroad centers too. The test was basically categorized into two large parts for four papers. The four papers include the topics which are – ‘ Fundamental of Accounting‘, ‘Mercantile Laws‘, ‘General Economics and ‘Quantitative Aptitude‘. The first part was organized in the morning between 10:30 am to 12:30 pm. The second part was recognized as an afternoon part which was conducted between 2 pm to 4 pm. All the four papers were carried out on the basis of some maximum marks, i.e., 60, 40, 50 and 50 accordingly. Each of the paper is conducted on criteria which include minimum 30 percent of marks as qualifying marks. Also, it is bounded by one another criteria which include minimum 50 percent of marks as passing marks in aggregate of all papers. Recently, January 8th, 2016 came up with notification by ICAI, which ended with a conclusion that the ranks which were issued in the context of CPT are coming to an end from CPT organized in December last year. In the recent years, there had been a qualifying percentage for CACPT, which was found to be 30 percent. The conversion table shows that 32,619 people qualified the test out of 1,28,916 number of the audience held in the previous year. ICAI is now entirely using the technology and making the declaration of result easier with less challenging tasks. CA Final exam results can be easily made visible on the mobile phones, and this technology is now shifted to the CPT results also for easy convenience. The result can be made easily visible with the help of SMS which is based on a particular procedure. • Firstly, open the ICAI website. • Press on the link which resembles the result of the exam in which you have appeared. • Now, there is a need to Login with your Roll number. • Login and enter your registration number or PIN number along with your Roll number. • The screen would be captured with your result. 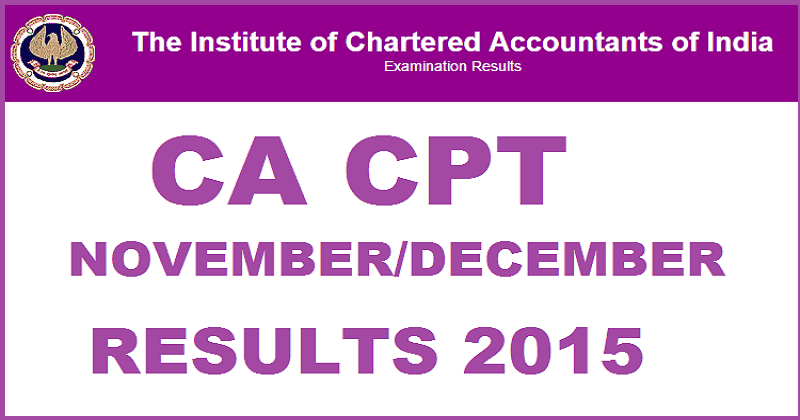 • For CPT result: CACPT (space) XXXXXX (Here, XXXXXX resembles your six digit Common Proficiency Test roll number. For example, CACPT 000112). And after typing this, send this message to 58888.